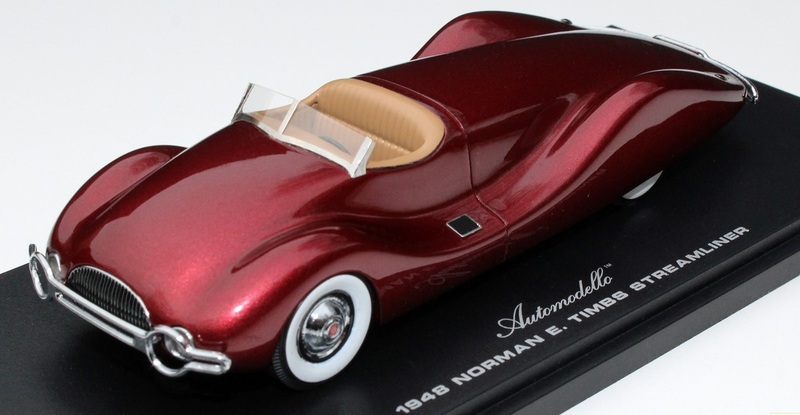 Few cars are as radically styled as Norman E. Timbs’ Streamliner. The Streamliner is a teardrop-shaped car that looks like an amoeba that should be wriggling on a slide under a microscope, except it’s a car. You’ve probably seen it and didn’t know what it was. 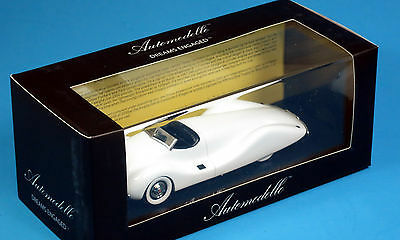 Now Automodello creates the swoopy 1948 Streamliner in 1:43 scale resin, and bathed in one of two colors. The original, in maroon metallic, has shown up at fancy car shows and in national car magazines. In fact, the original first appeared in the second issue of Motor Trend. How so? 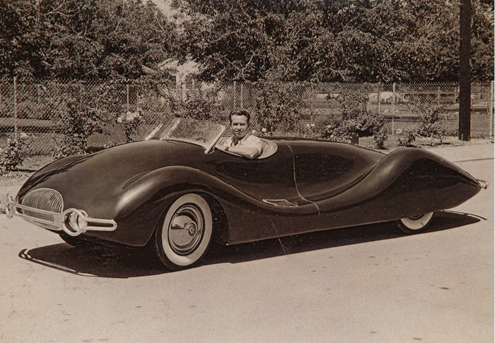 Norman Timbs in the original Streamliner he built in 1948. It’s powered by a Buick Inline 8 engine. 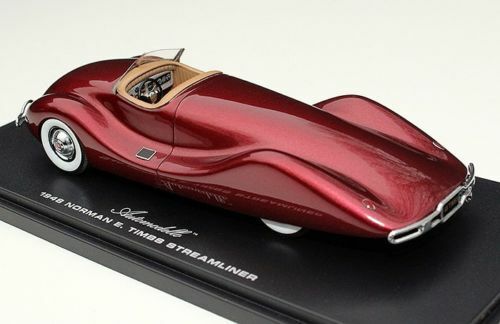 Timbs, a mechanical engineer who had helped design the Indy 500-winning Blue Crown Specials (Replicaz makes these in 1:43 and 1:18 scale) of the late 1940s, designed the Streamliner for himself at a cost of at least $10,000. It featured a custom aluminum body shaped around his hand-built wooden jig. The goal was a sleek, super streamlined coupe with a mid-engine layout. It’s reported that Timbs used Auto Union and Mercedes racers of the late 1930s as motivation. But he took the design to a pleasing personal car extreme, 17 feet in length and riding on a 117-inch wheelbase. Timbs built the Streamliner on a steel-tube frame with a Buick Inline-8 engine to power the light, 2,300-lb. coupe. Top speed was said to be 120 mph, but the car looks speedy, even sitting still. Like all of Automodello’s resin creations, this 1:43 model’s body is meticulously shaped. Comparing the model to a variety of images of the original car shows it’s a perfect match. Details here include a photo-etched Buick-like front grille and front bumper that includes giant chrome circles in front of the lower fender-mounted headlights. The rear bumper is equally elegant and includes a “48 Timbs” license and two tiny tear-drop shaped rear lights sit atop the tapered rear fenders. Tires are wide white sidewalls with chrome caps and there’s a rubber and chrome step pad on either fender by the cockpit to help a driver and passenger aboard. There are no doors. In fact, there is only one crease line, right behind the cockpit. The original’s entire rear body section folded back to provide engine access. The cockpit here has no roof, as on the original, just a chrome-trimmed V-shaped wind screen to protect occupants. The interior is tan with a black 3-spoked steering wheel and printed dash with the appropriate dials and gauges. There’s also a column-mounted shift lever. 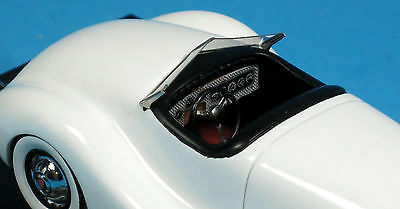 The white Tribute Edition features a black interior and just 48 of this edition are planned, while 499 of the original maroon car are available for $119.95 each. The Tribute Edition being rarer lists at $148. Timbs’ Streamliner is beautiful in shape and simplicity and exemplifies the design creativity of the post-war years. 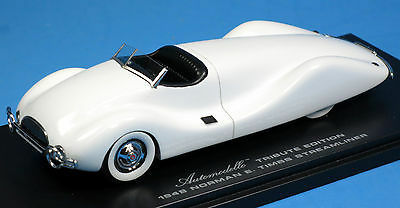 There is no rarer car than a one-off and the Streamliner is stunning in sparkling maroon or bright white.